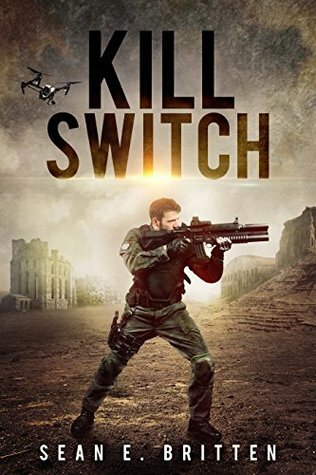 Kill Switch is the third book in a row I have read from author Sean E. Britten, the others being zombie stories Wave of Mutilation and Screamers. This time around it is a slight stretch to call it horror in the traditional sense but it falls neatly into the Battle Royale genre of people being forced to kill other people against their will, usually in some form of game show. Battle Royale is one of my favourite films of all time and the genre itself probably got most exposure in films thanks to The Hunger Games series. Both of those themselves were based on books and so it isn't new ground Britten has gone into. However nowadays this topic is more popular than ever, in large part thanks to the addictive Fortnite video game, as well as others like PlayerUnknown's Battlegrounds and the Blackout mode in the latest Call of Duty game. This is all a roundabout way of saying I love the idea and so even wearing its inspirations on its sleeves Kill Switch sang loudly to me. Taking place in the near future, James: a disgraced ex-detective serving time in prison finds himself signed up to a popular game show called Slayerz in which dangerous criminals are teamed up in pairs and forced to fight each other to the death over a large playing area. To make things more interesting all contestants are fitted with a special bracelet, should one of the pair in a team die than a kill switch will engage that kills the surviving member, but not before flooding them with drugs that gives them a last lease of life. Paired with sick serial killer Dali, James has no option but to work with him to take out the other contestants and hopefully win his freedom. Like with Wave of Mutilation the inspirations seemed obvious here, even the ones that may have been coincidental leapt out at me which at times almost but not quite pulled me out the story. I would say The Running Man film is one of the biggest inspirations, both in the larger than life villains taking part in Slayerz as well as James's cop background, this is all very similar. There is even a shout out to the plot of that film when James states he was in prison for real crimes and not because he was framed for refusing to fire on rioters which is of course what happened to Arnie in that film. While that seemed the largest influence it also seemed influenced by Battle Royale, specifically the second film that had a similar concept of people being paired up with both getting killed if just one of the people in the pair died. Now it may be coincidental but I just so happened to be reading the Transmetropolitan series of graphic novels at the same time as this and the comedic fake adverts that start each chapter here really reminded me of the dark humour of that series. Both of these envision a near future where life has become really cheap and meaningless, where the creation of more and more technology to extend life and make it easier has also led to a decrease in empathy for people. While Kill Switch could have worked as a serious novel this humour makes this all the more trashy and entertaining. The characters of Kill Switch are all complete caricatures and have no real defining features to them other than the different criminal types they portray. Each contestant has their own unique thing going on, included amongst them are such types as Latino gang members, punks, serial killers, cannibals, white supremacists and more. This just makes the battling between them all the more fun, and there is a lot of action. There were some standout characters such as an old Nazi who scuttles around om mechanical spider like legs. The Slayerz contest starts nearly right away in the book leading to a good 98% being set during the game. Each contestant is gifted their own weapon (just like in Battle Royale), while supply drops are dropped, and traps litter the arena (just like in The Hunger Games). Most of the fighting is brutal close combat shooting and physical brawling, all described in vivid violent detail. By the end there are many novel ways of people being killed, whether by explosion, grappling hooks shot through them, limbs destroyed, heads severed...basically the violence is endless and all so exciting to read. Sometimes you can get drawn into a book so deeply that you feel like you are watching events unfold on a screen, Kill Switch is one such book, the details are so on point that I felt like I was watching the best lost eighties action flick than reading text on a page. It was great timing that this book came to my attention as the idea it presents is one of my favourite things to follow currently in the world of entertainment media. Sure the ideas here may be derivative, it may have been done before, and it may not have too many ideas of its own but I absolutely loved Kill Switch and shall dive straight into the sequel Kill Switch: Serial Escalation that came out a few months back.